The following were the TNSAR trainings for the 2003 - 2004 season. Get familiar with this popular lost skier destination. Check out the pictures from the training. Great terrain--you'll need to know it on a search! Check out the pictures from the training. A hike/tour of Mt Rose area. Destination is the Peter Grubb Hut. We had a search here last year, so knowledge of this area is a plus! Check out the pictures. Using GPS to find our way. Mikey will take us up Deep Creek to Billy's. How about some pictures? 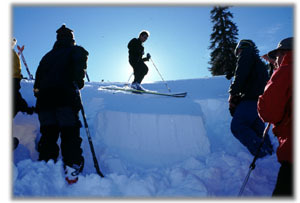 Geared for beginning and Intermediate skiers. Possible cancellation due to low snow, contact Peter. Postponed - will be rescheduled. Get familiar with the boundary of Sugar Bowl and see where people get lost. BE READY TO GO. Always a great training. See a search scenario up close and personal. The Bradley Hut will be reserved for Sat. nite. for those interested parties. Check out the photos and report. Hopefully El Dorado Co. SAR will join in. Where: Squaw Valley Fire Dept. This is for approved drivers only.On going. An up close look at how to work an avalanche scenerio. Time to breakout the headlamps and ski at night without the pressure of searching. A look at Alpines boundaries and a tour to the Five Lakes Creek area. Come for the day or come for the night. A chance to test your overnight backcountry skills. Ski the Westshore with a past president. Always a good training and tour. Meet at garage to carpool. Learn carrying techniques on low angle terrain. This is a follow up to the June 7 training. Check out the pictures. Meet at Team Garage to carpool. Learn the special considerations for packaging a patient for helicopter transport and see the helicopters we may encounter on a search and rescue operation. Learn the basics of radio direction finding operations when trying to locate a emergency location transmitter/beacon.